Reaching 50 is a big milestone! Make sure everyone at the party knows who is the center of attention with this personalized 50th birthday t-shirt. Each shirt features LARGE print for ease of reading. This shirt will be printed on premium white, machine-washable, 100% cotton. Comes in adult sizes S-3XL. Also available in Ash Gray or Pink. 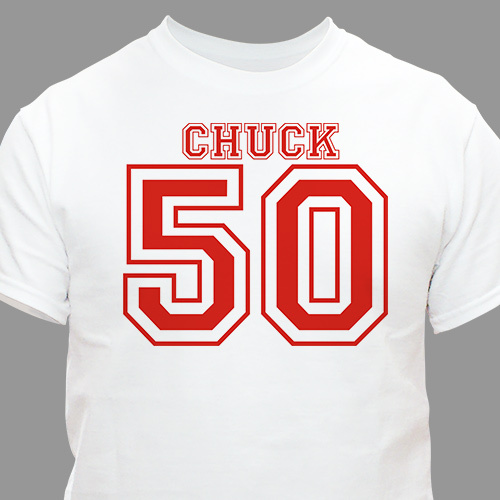 Personalize your Sports 50th Birthday T-Shirt with any age and any name. Select from 10 colors for printing. The shirt arrived right on time. For my sons 50th bday. He loved it. Very nicely made. Fast service.